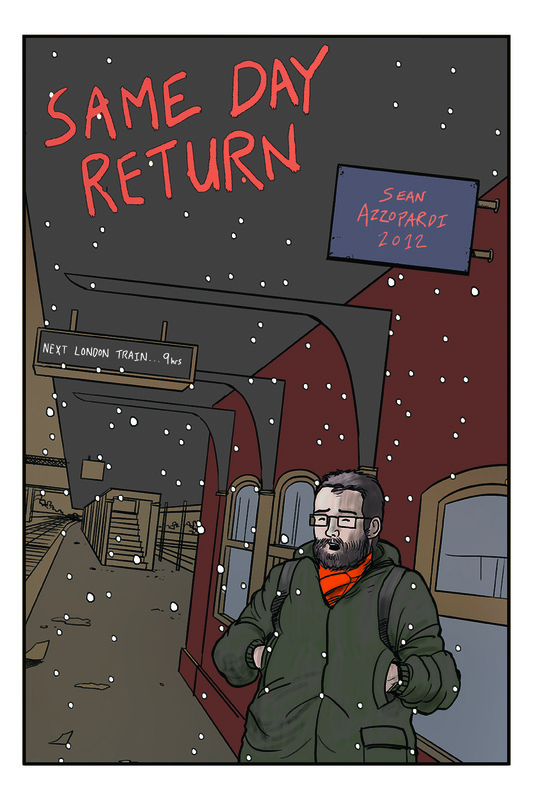 Same Day Return was debuted at Thought Bubble last. It has received a very positive response so far. Always a relief to get a response, it’s still an exciting experience. MOMB podcast gave some airtime to reviewing SDR, thank you Jane and the gang. Nice to see you at Leeds. Matt Badham included it in his list of buys from TB. This collection of diary and sketchbook work features some experiments in non-linear narrative that I think Azzopardi should develop further in future comics. Matt has been a massive supporter of my output for a long time, and this paragraph was very perceptive. Non – linear was something new to MY writing, and it was good to read it being noticed. Thanks Matt. Richard Bruton has just posted a review on the Forbidden Planet Blog. Some very interesting observations. This is more free-ranging, a comic reflecting a thought process, memory firing off in all directions, today, last week, 31 years ago, all at once it seems. In here you’re see Azzopardi fall back on his ‘tales of comics UK’ default only occasionally, instead focusing on memory, past lives, friends unseen for years, revisiting old haunts, familial remembrance. It’s complex, wide-ranging stuff. Chris and Taylor have reviewed Same Day Return on the recent Pop culture hound podcast. Poopsheet Foundation have coverd a bunch of my comics, including Same day Return. This is Azzopardi’s best work to date and something I recommend without qualification. Andy Oliver has reviewed SDR for his Comics Pressgang column. If you are interested in buying SDR then please have a look at some images and then the shop page. If any more reviews or responses appear they will be added to this post.